A project partly realized with crowd funding has just completed its first instrumental trials in water, the ICTINEU 3 which is a three man scientific submarine used in underwater exploration, will join the ranks of a very small number of submersibles with the capability to dive to 1.200 meters, putting it on par with depth technology from China Russia and the USA. 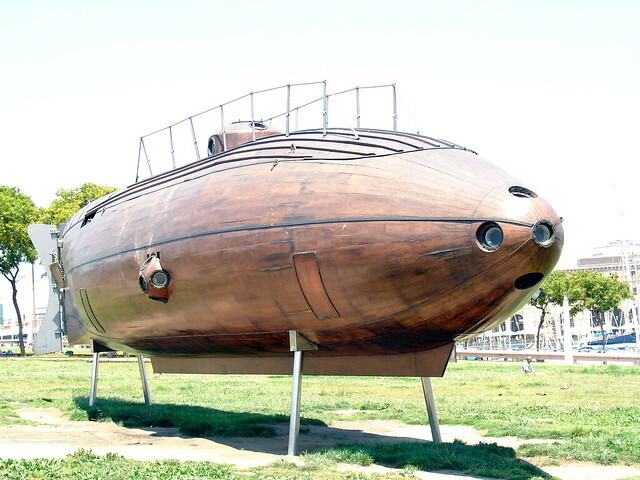 The Catalan built project continues a long tradition of submarine innovation dating back to 1857 with the forming of the first commercially dedicated society to submarines conceived by inventor engineer Narcís Monturiol i Estarriol. Monturiol developed an interest in submarines after watching coral harvesters in Cadaqués and witnessing the drowning of a man in the act of performing the risky job, and by 1859 Monturiol had launched the ICTINEU 1 submarine which performed around 20 successful dives before being destroyed in an accident in 1862. ICTINEU2 then launched in 1865 completing successful man-powered dives of up to 30 meters, but Monturiol not content with the limits of human power, began work to add engines in 1867 leading to several successful surface tests, unfortunately bankruptcy struck later on that year and projects ceased leaving the only examples as replicas standing on display in Barcelona, although not all of the submarines are Monturiol’s and there are various other submarines to spot around the city so try to book on site for a more detailed service than travel agencies provide and look further into Barcelona’s naval history . Continuing the passion more than a centenary later the new ICTINEU 3 concept submarine incorporates the latest in ergonomic design and space age materials, worlds away from the original designs and materials of Monturiol the new vessel boasts impressive capabilities such as 10 hours of autonomous use and 8 thrusters which allow full freedom of movement creating a versatile submersible tool perfect for furthering research of the largely undiscovered oceans as well as maintaining existing offshore platforms, piping, cabling and opening up fresh possibilities in the tourism exploration market. Expecting to be ready for ocean tests towards the beginning of 2015 the cost effective ICTINEU 3 is expected to be valuable to underwater exploration and prove an asset to the marine design and technology accomplishments of Barcelona. To find out more on Narcís Monturiol i Estarriol and other great caricatures still influencing modern design in Catalonia contact us @SafeJourneyBarcelona to arrange a detailed visit.